After deciding that our first cheese --- an acid cheese --- was too simple, it was time to move on to a cultured cheese. I followed this recipe for neufchatel, which uses buttermilk as the starter culture and rennet to make the curds separate from the whey. Rennet, I learned when hunting down these supplies, comes in several forms --- liquid animal, liquid vegetable, tablets, and powders. 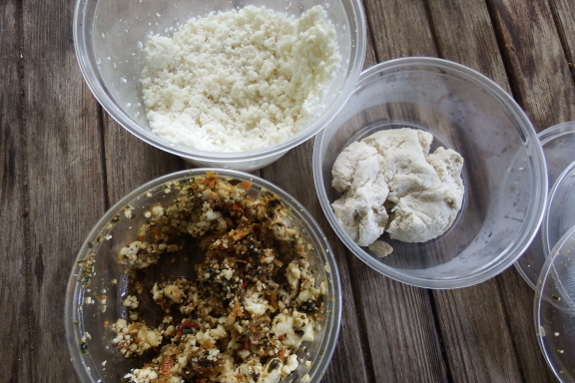 The powders are usually for bulk purchasers, tablets have a very long shelf life, liquid animal is easy to utilize in small quantities for fractions of the recipe, and liquid vegetable (as best I can tell) is a slightly bitter replica used by vegetarians. Since I wanted to be able to try half recipes, I opted for this liquid animal rennet. I'm not going to run through all of the instructions for making this cheese since you can find them at the link in the previous section. 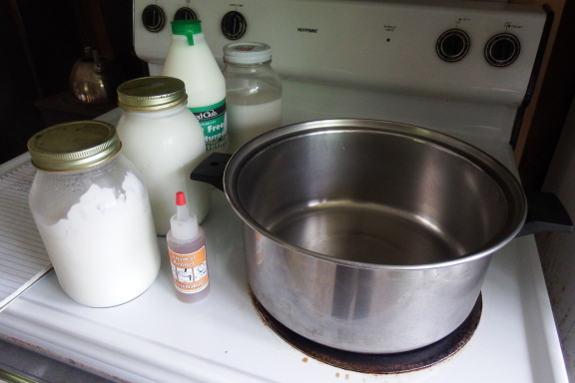 The shorthand version is: take 2 quarts of room-temperature milk, add two tablespoons of cultured buttermilk, dissolve two drops of liquid rennet in a quarter of a cup of water and add to the milk mixture, stir, then cover and let sit for about eight hours. 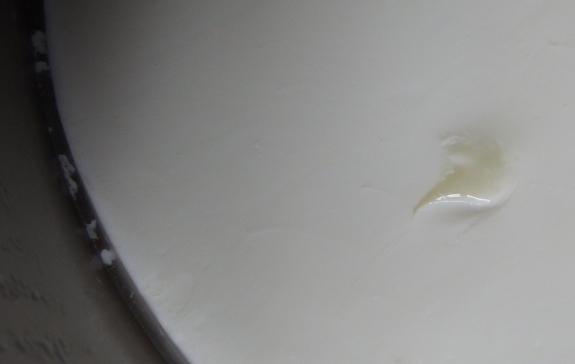 You'll know your cheese is ready for the next step when you see a clean break as is shown above. The final result gets half a teaspoon of salt mixed in and is then ready to eat! Mark and I tasted the neufchatel (top container), the same cheese mixed with some Hollywood sun-dried tomatoes, and ricotta made from the whey. (More on the ricotta in a later post.) Mark doesn't like goat cheese from the store, but he enjoyed this completely non-goaty cheese...while I actually missed the goatish overtones. Meanwhile, I've never been a fan of ricotta, but I thoroughly enjoyed the homemade version, while finding the Neufchatel a bit bland. As best I can tell, the reason this cheese is neufchatel instead of chevre is because it uses buttermilk as the starter culture. 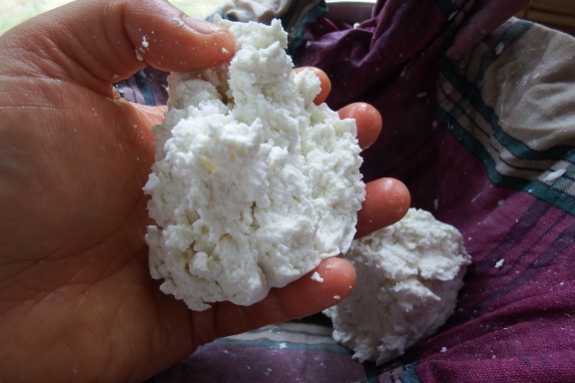 However, when I looked up the biology of chevre and buttermilk cultures, I learned that both contain some combination of Lactococcus lactis lactis, Lactococcus lactis cremoris, Lactococcus lactis diacetylactis, and Leuconostoc mesenteroides cremoris. It's probably still worth buying a chevre culture to see what I come up with using the other starter since my taste buds say this Neufchatel isn't the same as chevre. I don't have a lot of experience making cheese, but I've noticed that the blandness can sometimes be counteracted by adding a little more salt. I also wonder if squeezing the whey out quickly gives the bacteria less time to impart flavor to the cheese. Sort of like slow-rising breads. 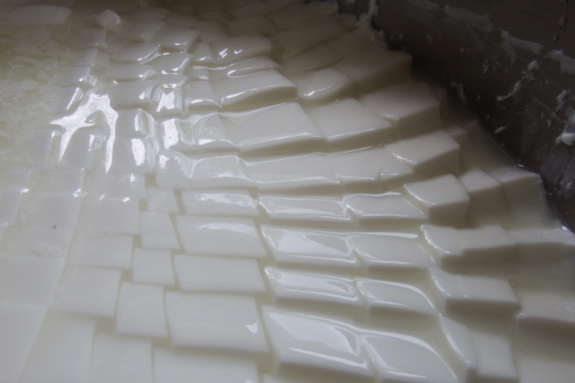 Or maybe if some of the whey liquid evaporates instead of draining, the flavorful whey solutes stay with the cheese? I'm definitely not up on my cheese-making theory, and where the majority of flavors are produced in non-aged cheeses. I'd agree with Jake. Bump your salt up a bit AFTER draining all the whey. The prolonged draining definitely makes a flavor difference. You might also let it culture longer before the actual cheese making. 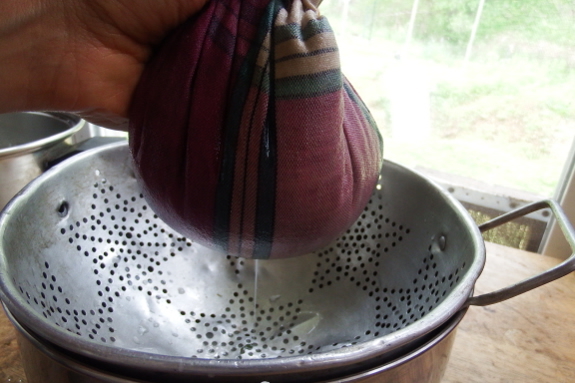 When I've made fromage blanc, I rigged up a hook over the sink (with a bowl underneath to catch yummy whey) and hung up my cheese tied into my butter muslin. I let it sit and drain/age until it tasted good. A really good resource for cultures and how-to/troubleshooting is Ricki the Cheese Queen. I think her website it New England Cheesemaking? She has a book, but I found that it was pretty redundant to the website info unless you're making something a bit more esoteric. Good luck! !